For Cleo Berry, the people dying of the Spanish Influenza in cities like New York and Philadelphia may as well be in another country--that's how far away they feel from the safety of Portland, Oregon. And then cases start being reported in the Pacific Northwest. Schools, churches, and theaters shut down. The entire city is thrust into survival mode--and into a panic. Headstrong and foolish, seventeen-year-old Cleo is determined to ride out the pandemic in the comfort of her own home, rather than in her quarantined boarding school dorms. But when the Red Cross pleads for volunteers, she can't ignore the call. As Cleo struggles to navigate the world around her, she is surprised by how much she finds herself caring about near-strangers. Strangers like Edmund, a handsome medical student and war vet. Strangers who could be gone tomorrow. And as the bodies begin to pile up, Cleo can't help but wonder: when will her own luck run out? 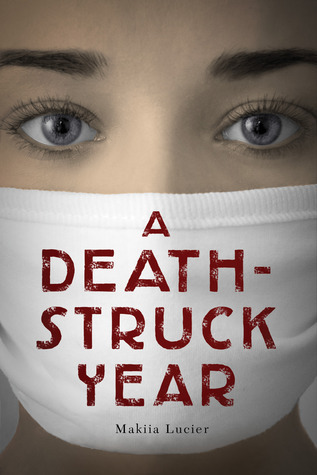 There have been quite a few good books about Spanish influenza in the last few years, but A Death-Struck Year stands out among them as unusually realistic. Put simply, it is a story about unlikely heroes, regular people who chose to help others when help was most needed, regardless of the danger. A Death-Struck Year is about a teen girl who joined the Red Cross volunteers during the outburst of Spanish influenza in Portland, despite being far too young to do so. I myself have spent many, many years volunteering for the Red Cross, and although my work was much simpler and far less dangerous, I loved seeing Cleo and her fellow volunteers portrayed in such a wonderful way. Just like everything else in this book, Cleo struck me as an unusually realistic character. She wasn’t particularly bold and she didn’t make the decision to help rashly. She was scared and uncertain like any other sane person would be, but she swallowed her fears, hid her age, and volunteered to help where help was most needed. It’s people like Cleo who are true heroes of every story, and I appreciated her uncertainty just as much as I appreciated her courage. The romance is subtle and uncomplicated, strong and reliable, and certainly not at the forefront of anyone’s mind at such a terrible time. Cleo and Edmund both have their hands full caring for the sick, which leaves them very little time to spend together and get to know each other, but his constant concern for her and vice versa is touching. Lucier chose to make her romance as straightforward as possible, leaving the drama completely out of the picture. The focus was always on the devastating effect the Spanish influenza had on Portland in October and November of 1918. Because of its realism, A Death-Struck Year has tremendous educational value. It’s obvious from this debut that Makiia Lucier is a very promising young writer from whom we can expect many more extraordinary novels. I cannot recommend this book enough. Sounds fascinating! I want to read more historical fiction, so I'm glad to see you recommend this one. I also like that the 'romance' is touching but not the main focus. It just wouldn't fit with a book like this. This one sounds fascinating. It's definitely on my watch list! I have been so curious about this one and really wanted to try it but have seen very few reviews for it. I am so glad you reviewed it today Maja because it solidifies for me that this will be a must read. This sounds amazing Maja! I like that it's incredibly realistic and hugely emotional, and of course I'm glad to see there's a romance. This is definitely the type of story that needs a subtle romance though, so I'm glad to see that's what we get:) Because this story is so well done in the realism department though, I know I'm going to be convinced I have Spanish influenza by the time I'm done reading. I can't help it:) Fantastic review! I've read some great reviews for this book,but yours solidified the reason why I should pick this up. I like the ordinary people turned heroes. I find their stories resonates with me more. I'm now completely sold on this one, realistic characters and the main focal point of the novel being on taking care of the ill totally appeal to day-job me, the nurse! Thanks for your great review, Maja! P.S. : Straightforward and understated romance also helped! I really need to read this one. I've read a few other great reviews for it, and I love realistic characters. Great review! I'd been thinking of getting this one before but now I know I MUST. I like that it's set in Portland (where I live) and I love the time period and subject. Even though it's dark, it's fascinating stuff! Thanks for your review, it sealed the deal, I NEED this one! I've seen this one around and was curious but haven't picked it up yet...sounds like I need to change that! Cleo sounds like a great character study, especially if she's so realistic. I read this during Christmas break and I liked it, my review goes tomorrow. This book of course had a high appeal since it takes place where I live. I still need to take a drive downtown and look up some of the sites in the book. I thought this was well done and educational. My only disappointment was the open ending. it's nice to have something realistic like that. I heard great things about this one a few time ago but I'm glad you had a good time with it. I'm definitely curious. Yay! I've just started this one so the fact that you gave it such a high rating is great. I actually don't know much about the Spanish influenza so I'm hoping to learn more about it from this one. The fact that things are portrayed realistically just means that I'm more likely to be sure that the knowledge I gain from reading this is accurate. Thanks, Maja! I've had my eye on this one, but I hadn't come across any reviews of it until today. I am definitely going to put this on my reading list, it sounds a true to life, thoroughly researched novel and I'm sure to learn more than I ever knew before about Spanish influenza. Thank you for this lovely review! Books about plagues are always fascinating and I really like how realistic it sounds! Characters who aren't the bravest, most intelligent etc always impress me more. The fact that they have real fears and manage to overcome them is much more interesting to read about :) I can't wait to give this one a try!